Japanese gaming equipment brand Konami showed its latest Concerto slot machine cabinet (pictured) at Global Gaming Expo (G2E) Asia 2018. 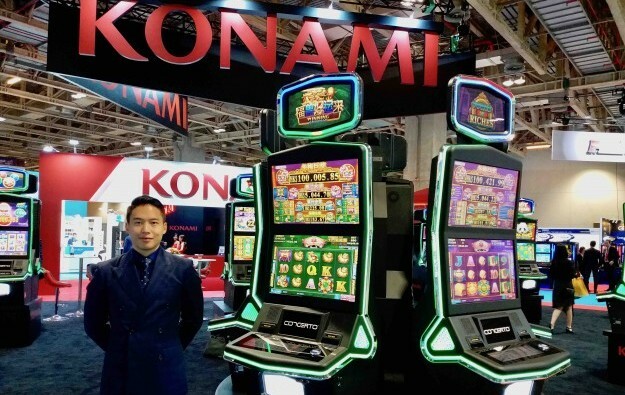 “It was approved in Macau recently,” Matthew Loon (pictured), product and marketing manager for Konami Australia Pty Ltd, told GGRAsia during the event last week. “Concerto is a completely new platform, with 23-inch monitors,” added Mr Loon, noting it was “a lot more powerful” than previous cabinets. “It plays all our latest products and you can definitely tell the difference in the graphics,” he stated. Gaming and amusement conglomerate Konami Holdings Corp operates outside Japan via Konami Australia and U.S.-based Konami Gaming Inc.
A total of five game titles and one game series is available for the new cabinet. The series is called “Cai Lai Si Ji” – offering so-called ‘standalone progressive’ slot play – and consists of three game titles: “Winning Animals”, “Power of Riches” and “Wealth of Dynasty”. “We are very excited to see how the series performs,” said the product manager. The Winning Animals game is an example of the company’s “Ultra Reels Prime” slot product. “It is a ‘ways’ game, rather than a lines game,” Mr Loon explained, pointing out the possibilities for triggering features based on the same symbols appearing in different parts of the screen, rather than purely in straight lines. “This game has two pay tables,” Mr Loon said. “It has a normal pay table as well as the ‘gold’ pay table and depending on how high a player bets, it activates more ‘gold’ symbols,” he noted. All three games in the series “have their own unique free games feature, but what they have in common is the Cai Lai Si Ji bonus,” the Konami manager added. GGRAsia asked Mr Loon whether in Asia Pacific markets consumers had been moving toward preference for single-jackpot or “standalone” machines rather than linked-jackpot ones, albeit with in each case a “progressive” style of play, where the greater the bets, the greater the opportunities to trigger features and or minor or major jackpots. Many suppliers at this year’s G2E Asia had highlighted standalone progressive products. A linked progressive slot product on display at Konami’s stand was “Fortune Streams”. It uses – in video rather than mechanical format – elements of a traditional coin push game you might see in an arcade. “This is our next key product that we hope to introduce in Macau,” said the product manager. During G2E Asia 2018, Konami also exhibited for the first time this year a tall-screen version of its Concerto cabinet – known as the “Concerto Stack”. “It’s got its own unique library of games,” Mr Loon told GGRAsia. They include “Star Watch Fire” and “Star Watch Magma”. “This product is performing exceptionally well in the U.S. market, and also parts of Europe,” he stated. In the U.S. it was “doing over three times the average” daily in terms of cash in, he added. In Asia it will “most likely go to the Philippine market first,” said Mr Loon.